In the late 1960s, Brown—a recent college graduate working for IBM and his real estate developer father—became entranced by wine while visiting a friend’s Napa winery. He fell so quickly and deeply into the barrel, he began doing things that raised eyebrows. “I never found anything I was so captivated by as winemaking,” he admitted. “I said to myself, ‘I don’t care what I’m giving up.’” First, Brown headed right back to school—new mortgage and all—puzzling friends and leaving a lucrative career in his wake. 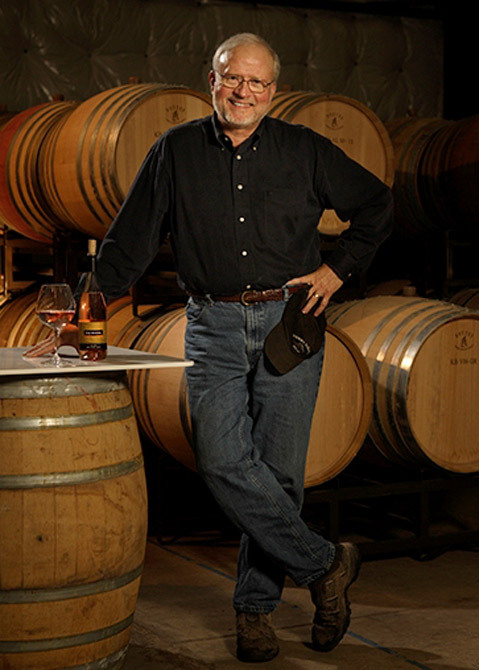 He studied both viticulture and oenology at Fresno State in the ’70s, when participating in both programs was almost taboo. “I felt like I had to sneak from one building to the other,” he joked. In 1977, when Santa Barbara could count the number of its wineries on one hand and Brown was still in school, Marshall Ream of Zaca Mesa hired him to design, equip, and staff the new winery. In this way, Brown mentored dozens of winemakers who are now considered pioneers in their own right, like Jim Clendenen of Au Bon Climat and Qupé’s Bob Lindquist, who started out as Zaca Mesa’s tour guide. Coincidence or not, Brown’s wine career and the Santa Barbara wine industry flourished together as Zaca Mesa’s excellent reviews brought praise to the region. However, when the dot-com recession of the late 1990s set in, Brown soon watched the Mondavis experience what had happened at Zaca Mesa—pushed beyond the limits of its growth, the winery began to crumble from within. So, without abandoning Byron, Brown started a new winery with his wife, Deborah, under his own name. As crucial as having state-of-the-art equipment is to Brown, he spends an extraordinary amount of time in the vineyards. He only buys fruit via acreage contracts in lieu of tonnage ones. Doing so puts his name on specific rows of vines that he can be meticulous about. He delights in working with the vineyard crew, who he jokes know him for being nitpicky. Indeed, Brown is even thorough while pouring his wines, referencing topographical maps to elucidate each wine’s vineyard and terroir. He emblazons the maps on his walls like parents show off photos of their children, and knows every groove of the vineyards’ landscapes as a parent know the dimples on their infant’s cheeks. For more information, see kenbrownwines.com.